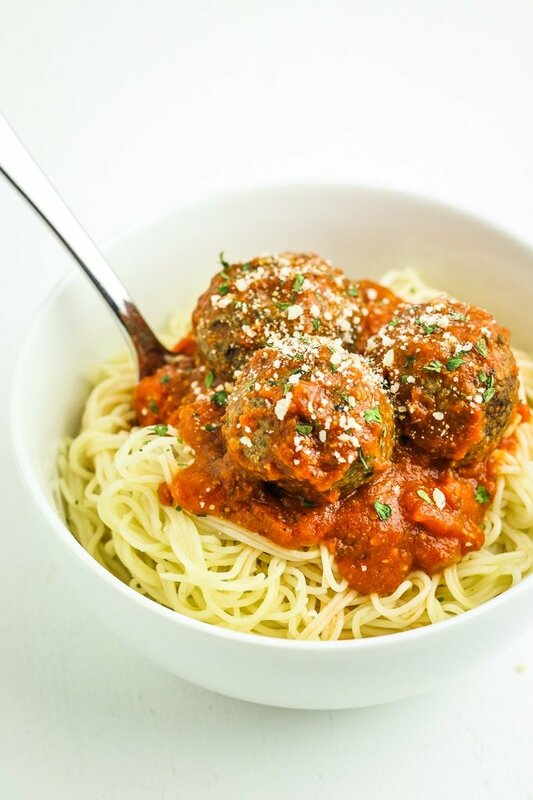 This quinoa mushroom meatballs recipe makes delicious, hearty vegan meatballs. These are perfect for serving over pasta, veggie noodles, sautéed veggies, or as a quick snack. Vegan meatballs. Meatballs. With no meat. Say what?! YUP. We’re doing it and we’re doing it right. How does this work without meat, you ask? Simple! We combine quinoa with sautéed mushrooms, onions, and garlic. Then we add all of the seasonings that make these meatballs taste magical. Then we stir it all together, roll it into meatballs, bake them, and enjoyyyyy. 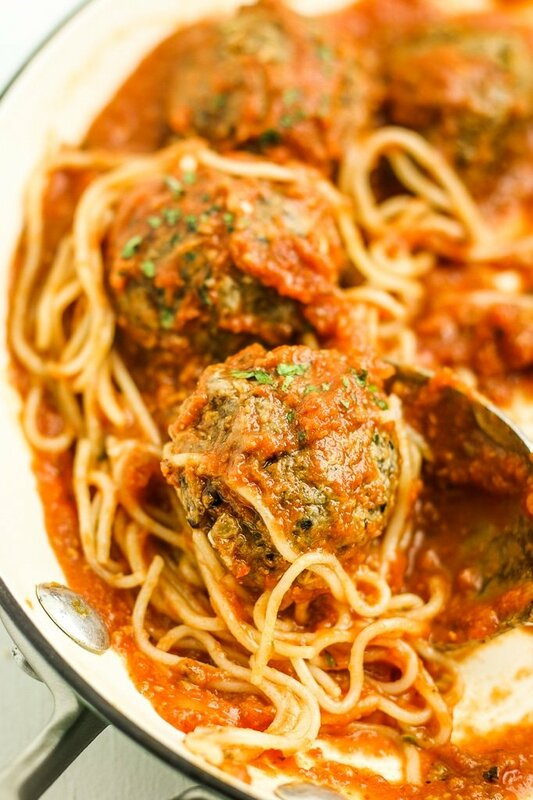 All that you really need to know is that these vegan meatballs taste freaking incredible. At the risk of sounding ridiculous, these actually taste like real meatballs. The texture of the mushrooms combined with all of the savory flavors… it just WORKS. Trust me. 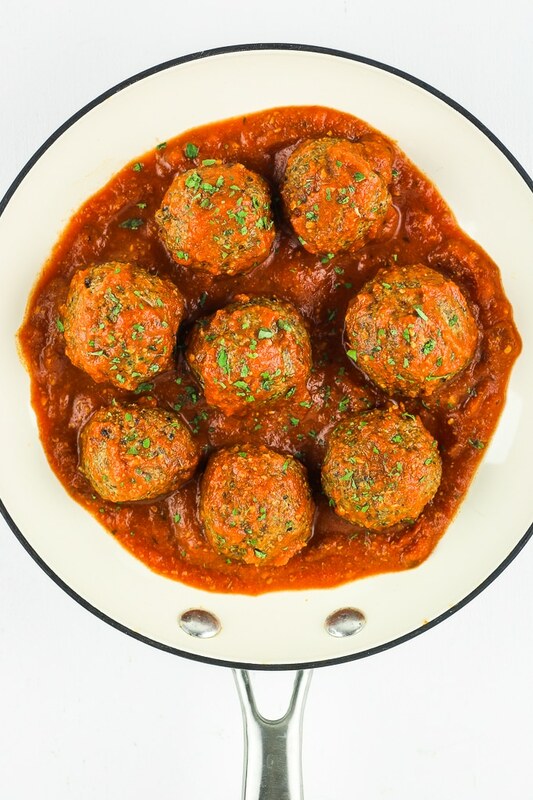 There are so many different ways to enjoy these meatballs. Make a batch of them and serve pasta, or veggie noodles, or meal prepped with some veggies. They’re just as delicious when reheated out of the fridge and they freeze well, too. You’re gonna make these vegan meatballs ASAP, right? Obviously. And you’re gonna post a picture of them on Instagram so I can share it on our stories, right? Thought so. 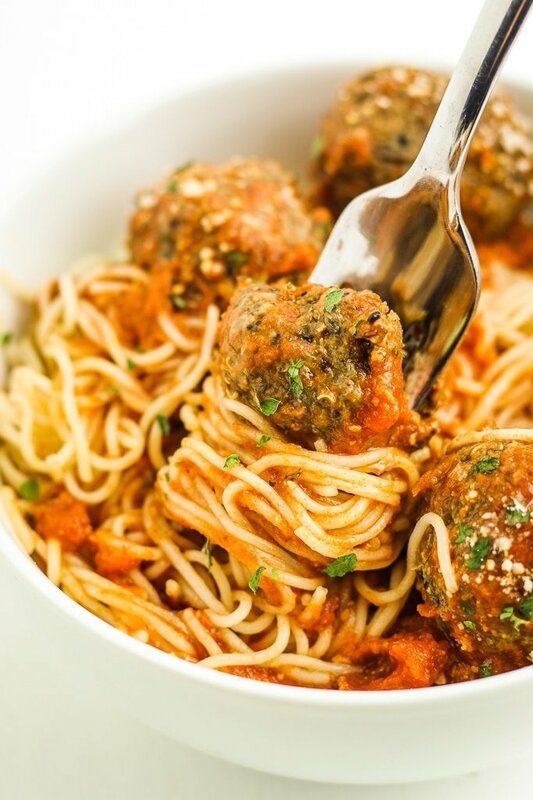 This vegan quinoa mushroom meatballs recipe makes delicious, hearty vegan meatballs. These are perfect for serving over pasta, veggie noodles, sautéed veggies, or as a quick snack. In a large skillet, bring 2 tablespoons of oil to medium heat. Add onion and saute 5 minutes until soft and translucent. Add garlic and mushrooms. Saute 5-8 minutes until the mushrooms are tender (don’t overcook to the point where they’re soggy!) Remove from heat and allow to cool. Add the quinoa and the mushroom + onion + garlic mixture to a food processor. Pulse until well combined. The mixture should resemble a rough paste. Empty into a bowl. Add oat flour, remaining ¼ cup of quinoa, Italian herb seasoning, red pepper flakes, nutritional yeast, tamari, salt, and pepper. Stir to combine. Create your meatballs! Scoop the mixture out 1 tablespoon at a time, then roll into balls and place onto the baking sheet. Bake 25-30 minutes, then serve as desired! Wow, these are AMAZING! I’m newly vegan and didn’t think this was even possible! THANK YOU!!!! OMG! Awesome. :) I’m so glad you enjoy this recipe. Thanks for commenting! Yum! Nice additions. :) I’m glad you enjoyed! Loved these! My favorite vegan meatballs yet! If you mentally prepare to eat something with a raw cookie dough texture, go for it! I am not a vegan but thought these would be fun to try. They were. ONCE! Hi Connie! I’m sorry you didn’t like this recipe. 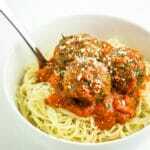 Anytime I’ve made these meatballs, they turn out nice and tender on the inside, almost the same texture as meat. I’ve had lots of people try them and enjoy them! Something must’ve gone wrong with the process when you made them. Hey, just wondering how many calories there are per meatball?